Alexander R. Galloway is an assistant professor at New York University. He is author of Protocol: How Control Exists After Decentralization (Cambridge, The MIT Press, 2004), and a founding member of the software development group RSG. On 21 March 2003, a day into the war in Iraq, Sony filed a trademark application for the phrase "shock and awe," apparently for future use as a PlayStation game title. The phrase, and the American military strategy it describes, was in fact not such an unlikely candidate for the PlayStation. The console system has long flirted with game formats based in realistic scenarios, from Sony's own SOCOM: U.S. Navy Seals (2002) to Electronic Arts's Madden NFL (2004). A month later, responding to criticism, Sony dropped the application, stating they did not intend to use the expression "shock and awe" in any upcoming games. But they have not dropped their fetish for realistic gaming scenarios. Indeed, reality is thriving today in many types of media, particularly gaming where the polygon count continues to go up and up, or in cinema with the Wachowski brothers continuing to ruminate on the nature of "the real" (via Zizek, via Baudrillard, and back to Lacan one presumes), or in television in the form of reality television. The conventional wisdom on realism in gaming is that, because life today is so computer-mediated, gamers actually benefit from hours of realistic gameplay. The time spent playing games trains the gamer to be close to the machine, to be quick and responsive, to understand interfaces, to be familiar with simulated worlds. This was Ronald Reagan's argument in the 1980s when he famously predicted that action videogames were training a new generation of cyber-warriors ready to fight real foes on the real battlefield (itself computer-enhanced). Today it is evident that he was right: flight simulators, Doom and now America's Army (2002) are all realistic training tools at some level, be they skill-builders in a utilitarian sense or simply instructive of a larger militaristic ideology. In scholarship thus far the discourse on realism in gaming has been limited mainly to talk of screen violence and its supposed deleterious effects on gamers. This talk has grown so loud that I can't help conjure up various equations and feedback loops tallying doses of violent intake measured against the gamer's future evil-doing. Call this the "Columbine theory" of realism in gaming: games plus gore equals psychotic behaviour, and around and around. The Columbine theory is not the only interesting debate however, and, granting it due significance to social scientists and the like, I will politely side-step it here, and return to the debates around realism as cultural critics have engaged them to date in other media. In this essay I would like to describe how traditional theories of realism can be applied to electronic games, and then propose an expansion of the concept of realism to include new problems that games present. Within the world of gaming it is possible to divide games into two piles: those that have as their central conceit the mimetic reconstruction of real life, and those resigned to fantasy worlds of various kinds. So, SOCOM is about the real Navy Seals, The Sims Hot Date (2003) is about real dating (one assumes) and Madden NFL is about the real National Football League, while games like Final Fantasy X (2001),Grand Theft Auto III (2001) and Unreal Tournament 2003 transpire in fictional worlds with fictional characters and fictional narratives. Thus games are generally either realistic or fantastical. Expressing the perspective of game designers, Bruce Shelley writes that realism is a sort of tool that can be leveraged for greater effect in gameplay, but is ultimately non-crucial: "Realism and historical information are resources or props we use to add interest, story and character to the problems we are posing for the player. That is not to say that realism and historic fact have no importance, they are just not the highest priority (Shelley,2001). But realistic narrative and realistic representation are two different things. So these two piles start to blur. For instance, listening to music, ordering pizza and so on in The Sims is most probably closer to the narratives of normal life than is storming an enemy base in SOCOM,despite the fact that the actual visual imagery in SOCOM is more realistically rendered than the simplistic avatars, isometric perspective, and non-diegetic wall cutaways in The Sims. Likewise Unreal Tournament 2003 has a more photo realistic graphics engine than Grand Theft Auto III, but the former's narrative is sci-fi fluff at best, leaving it at a loss for realism. During the Cold War, games like Missile Command (1980b) presented a protorealist anxiety narrative about living under the threat of nuclear annihilation, yet the game's interface remained highly unrealistic and abstract. The infamous game NARC (1990) presented a realist window into urban blight by depicting police violence and drug dealers, couching its gory imagery in an anti-drug stance. Atari's BattleZone (1980a), one of the first games to feature a truly interactive three-dimensional environment, was deemed so realistic by the United States military that they hired Atari to build a special version that could be used to train tank pilots. Yet the game's vector graphics are too sparse and abstract to qualify as truly realist. If these games are any indication, it would seem that gaming is a purely expressionistic medium with no grounding in realism no matter how high the polygon counts or dots-per-inch, or perhaps that gaming is one of those media, like the novel or the animated film, whereby an immense chasm stands between empirical reality and its representation in art. "'Realism' is, however, a particularly unstable concept owing to its simultaneous, yet incompatible, aesthetic and epistemological claims, as the two terms of the slogan, 'representation of reality,' suggest. These two claims then seem contradictory: the emphasis on this or that type of truth content will clearly be undermined by any intensified awareness of the technical means or representational artifice of the work itself. Meanwhile, the attempt to reinforce and to shore up the epistemological vocation of the work generally involves the suppression of the formal properties of the realistic 'text' and promotes an increasingly naive and unmediated or reflective conception of aesthetic construction and reception. Thus, where the epistemological claim succeeds, it fails; and if realism validates its claim to being a correct or true representation of the world, it thereby ceases to be an aesthetic mode of representation and falls out of art altogether. If, on the other hand, the artistic devices and technological equipment whereby it captures that truth of the world are explored and stressed and foregrounded, 'realism' will stand unmasked as a mere reality- or realism-effect, the reality it purported to deconceal falling at once into the sheerest representation and illusion. Yet no viable conception of realism is possible unless both these demands or claims are honoured simultaneously, prolonging and preserving rather than 'resolving' this constitutive tension and incommensurability." So, when one thinks solely in terms of realistic-ness Jameson's "naïve and unmediated or reflective conception of aesthetic construction" one detracts from a larger understanding of realism. Put another way: realistic-ness and realism are two very different things. André Bazin defined realism in the cinema as a technique to approximate the basic phenomenological qualities of the real world. And he knew well that "phenomenological qualities" did not simply mean realistic visual representation. It also means real life in all its dirty details, hopeful desires and abysmal defeats. Because of this, realism often arrives in the guise of social critique. Realism in the cinema, dubbed "neorealism" at the time to distinguish it historically from its predecessors in literature and fine art, is defined by several formal techniques. These include the use of nonprofessional actors, the absence of histrionics, real life scenery, amateur cinematography, grainy filmstock, long takes and minimal editing. But further, Bazin also associated neorealism with a certain type of narrative,not simply a certain type of form. While Bazin acknowledges the formal tendencies of realism (long takes, amateur actors and so on), and even praises the mise-en-scene of filmmakers like Vittorio De Sica, he writes that "we would define as 'realist,' then, all narrative means tending to bring an added measure of reality to the screen" (1971). Thus, it is the story of the unemployed father that ultimately constitutes the realist core of De Sica's Bicycle Thief, not its degraded style. Jameson follows this by reinforcing what Bazin knew to be obvious, that neorealism was fundamentally a socialist political practice, and not merely a style of film focused on recreating the "real." Jameson writes that "realism is to be conceived as the moment in which a 'restricted' code manages to become elaborated or universal" (1971). The restricted code is, in this case, the code of the working class, what Raymond Williams would call their "structure of feeling." Elsewhere the philosopher Gilles Deleuze (1986, 1989) also recognized that neorealism was crucial, situating it at the conceptual turning point from the relatively reified and dominant "movement image" to the emancipatory "time-image" in his work Cinema 1 & 2. Here's how Bruno Reichlin recently described neorealism in Italian literature: A surgical examination of matters of society, an almost documentary attention to the everyday, an adherence in thought and language to the social origins and personalities of the characters, a more-or-less direct criticism of current society and morals (2001). I suggest that game studies should follow these same arguments and turn not to a theory of realism in gaming as mere realistic representation, but define realist games as those games that reflect critically on the minutia of everyday life, replete as it is with struggle, personal drama and injustice. This theoretical project is already beginning in Gonzalo Frasca's work. His essay "Videogames of the Oppressed" examines how games are able to raise social and political issues (2004) . As a game designer Frasca is also interested in the genre he calls "news gaming," that is, games based on actual news events. His game September 12th, A Toy World (2003) deals with the war on terrorism, albeit using the somewhat unrealistic visual idiom of a cartoon-drawn, web-based bombing game. Other games such as 911 Survivor (2003) or Waco Resurrection (2003) directly reference current geopolitical events. The game company Kuma refers to this genre as "reality games" and offers their own Kuma\War (2004) game with episodes ripped directly from recent conflicts in Iraq and Afghanistan. The games discussed thus far all strive for a high level of realistic-ness. But as I have tried to show, social realism is an entirely different matter from mere realistic representation. Thus, how can one find true realism in gaming? Is social realism even possible in the medium of the video game where each pixel is artificially created by the machine? What would it mean for the concept of "play," a word that connotes experimentation and creativity as much as it does infantilizing, a-political trivialities? Forty years of electronic games have come and gone and only now does one see the emergence of social realism. State of Emergency (Figure 1), the riot game from Rockstar Games, has some of these protorealist qualities. The game co-opts the spirit of violent social upheaval, seen in events like the Rodney King rebellion in Los Angeles, California and transposes it into a participatory gaming environment. The game is rife with absurdities and excesses and in no way accurately depicts the brutal realities of urban violence. So in that sense it fails miserably at realism something like a NARC for the new millennium. But it also retains a realist core. While the game is more or less realistically rendered, its connection to realism is seen primarily in the representation of marginalized communities (disenfranchised youth, hackers, ethnic minorities and so on), but also in the narrative itself, a fantasy of unbridled, orgiastic anti-corporate rebellion. The game slices easily through the apathy found in much mass media today, instructing players to "smash the corporation" and then giving them the weapons to do so. The Swiss art group Etoy also achieved protorealism in gaming with their online multiplayer game Toywar (1999, Figure 2). Part artwork, part game and part political intervention, this primitive MMORPG was cobbled together in a few quick weeks of programming. The goal of the game was to fight against the dot-com toy retailer eToys.com by negatively effecting their stock price on the NASDAQ market. The toy retailer had recently sent a lawsuit to Etoy for trademark infringement due to the similarity of the two organization's names. Many considered the lawsuit bogus. But instead of battling their corporate rivals in court, Etoy went public and turned the whole fiasco into a multiplayer game, enlisting the public to fight the lawsuit on their behalf. The Toywar battlefield, which was online for only a few months, is a complex, self-contained system, with its own internal email, its own monetary system, its own social actors, geography, hazards, heroes and martyrs. Players were able to launch "media bombs" and other public-relations stunts aimed at increasing public dissatisfaction of eToys.com's lawsuit. In the first two weeks of Toywar, eToys.com's stock price on the NASDAQ plummeted by over 50 percent and continued to nosedive. Of course, eToys.com's stock price was also crashing due to the general decline of the Internet economic bubble, but this economic fact only accentuated the excitement of gameplay. Eventually a few billion dollars of the company's stock value disappeared from the NASDAQ and the toy retailer declared bankruptcy. 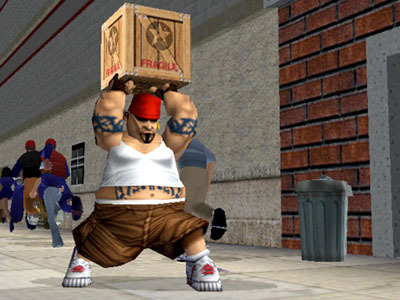 Whereas State of Emergency (2003) prodded gamers to smash a hypothetical corporate thug, Toywar gave them a chance to battle a real one. And this is the crucial detail that makes Toywar a realist game. 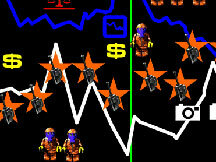 For, similar to a simulation or training game, Toywar constructed a one-to-one relationship between the affective desires of gamers and the real social contexts in which they live. This is not to say that realism in gaming requires an instrumental cause and effect between the gamer's thumbs on the controller and some consequence in the so-called real world not at all; that would return us to the trap of the Columbine theory. Instead I suggest there must be some kind of congruence, some type of fidelity of context that transliterates itself from the social reality of the gamer, through one's thumbs, into the game environment and back again. This is what I call the "congruence requirement" and it is necessary for achieving realism in gaming. Without it there is no true realism. With the "congruence requirement" in mind, it is important to make a distinction between games that are modelled around real events and ones that actually claim to be an extension of real life struggle (via virtual training sessions, or politically utopian fantasies). This brings us to America's Army (Figure 3). What is interesting about America's Army is not the debate over whether it is thinly-veiled propaganda or a legitimate recruitment tool, for it is unabashedly and decisively both, but rather that the central conceit of the game is one of mimetic realism. America's Army, quite literally, is about the American army. 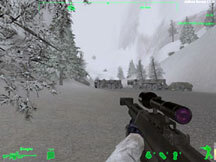 Because it was developed by the American army and purports to model the experience of the American army, the game can claim a real material referent in ways that other military games Delta Force (2003), SOCOM, and so on simply cannot. So one might think that America's Army is a realist game par excellence. But following the definition of realism stated earlier and my "congruence requirement" it is clear that America's Army does not achieve realism on either account. As in the Reichlin citation given previously, realism requires "a more-or-less direct criticism of current society and morals" which America's Army does not do, nor does it aspire to do. In fact the game can be viewed in exactly the opposite framework: as a bold and brutal reinforcement of current American society and its positive moral perspective on military intervention, be it the war on terrorism or "shock and awe" in Iraq. Further, as the citation from Jameson above shows us, realism happens in certain moments when "a 'restricted' code" captured from out of the subjugated classes "manages to become elaborated or universal." Again America's Army does nothing of the sort. If the army has a discursive code it is certainly not restricted, but is all-powerful, practically universal. It needs no further elaboration. It comes to us already elaborated in everything from television recruitment advertisements to multi-billion dollar procurement bills. And as for the congruence requirement, well it fails too if not even a scrap of basic realism is achieved. But even so, one cannot claim there to be a fidelity of context between an American teenager shooting foreign enemies in America's Army and the everyday minutia of that teenager, the specificities of his or her social life in language, culture and tradition. These are realistic war games, yes, but they are not realist. So by itself America's Army is not that successful as a realist text. However, with the advent of two new games America's Army may be seen in a new light as the realist fantasy/illusion it is. These two new games are Special Force (2003, Figure 4) released by the Lebanese organization Hizbullah and Under Ash (2001) released by the Syrian publisher Dar Al-Fikr. The ideological opposite of America's Army, these two new games are first-person shooters played from the perspective of a young Palestinian participating in the Islamic jihad. They are, in a sense, the same militaristic narrative as American-made shooters, but seen instead from the Islamic fighter's point of view, just as the narrative of Opposing Force (1999) literally reverses the perspective of its predecessor Half-Life (1998). (The obvious militaristic fantasy then of course is to network players in Damascus against players in the Israel Defence Forces and battle this thing all out in virtual space.) These Palestinian first-person shooters have roughly the look and feel of America's Army, albeit without the virtuoso photorealism of detailed texturing, fog and deep resolution available in the army's commercially licensed Unreal graphics engine. What differs is narrative not representation. If one is to take the definition of realism given above a documentary-like attention to the everyday struggles of the downtrodden, leading to a direct criticism of current social policy then Special Force and Under Ash are among the first truly realist games in existence. 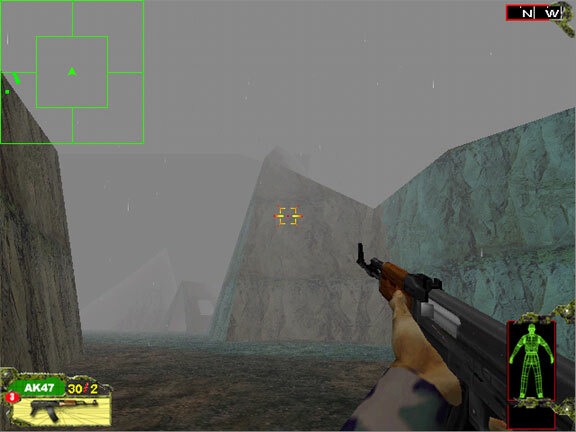 Published by the Central Internet Bureau of Hizbullah, Special Force is a first person shooter based on the armed Islamic movement in South Lebanon. The narrative of the game is delivered mostly through text-based briefings presented at the beginning of each level, which initiate the player-character as a holy warrior fighting against Israeli occupation. The gameplay itself however does not carry a strong narrative message, except for sprinklings of pro-intifada and anti-Israeli iconography. The gameplay is based instead on combat scenarios common in first-person shooter games such as traversing mine fields, killing enemies and so on. So while the action in Special Force is quite militaristic, it feels like a simple role reversal, a transplant of its American counterparts, with Israelis as the enemies rather than dark-skinned Arabs. The realism of the game is simply its startling premise, that the Palestinian movement is in fact able to depict its own "restricted code" in a shooter game. Under Ash, from Damascus, depicts the plight of a young Palestinian man during the intifada. The game turns the tables on Israeli occupation, letting the gamer fight back, as it were, first with stones, then with guns. The game is not fantasy escapism, though, but instead takes on an almost documentary quality, depicting current scenarios in the occupied territories such as the demolishing of Palestinian houses. Combat is central to the narrative but slaying of civilians is penalized. In addition, the game is distinctly difficult to play, a sardonic instance of socio-political realism in a land fraught with bloodletting on both sides. Whereas Special Force is unapologetically vehement in its depiction of anti-Israeli violence, Under Ash takes a more sober, almost educational tone. 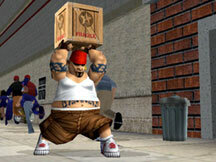 The game's designers describe Under Ash as acting in opposition to what they call "American style" power and violence. Realizing that Palestinian youth will most likely want to play shooter games one way or another, the designers of Under Ash aim to intervene in the gaming market with a homegrown alternative allowing those youth to play from their own perspective as Palestinians, not as surrogate Americans (as playing SOCOM might surreptitiously force them to do). Under Ash players, then, have a personal investment in the struggle depicted in the game, just as they have a personal investment in the struggle happening each day around them. This is something rarely seen in the consumer gaming market. The game does nothing to critique the formal qualities of the genre, however. Instead it is a cookie-cutter repurposing of an American-style shooter for the ideological needs of the Palestinian situation. The engine is the same, but the narrative is different. Now, contrasted with these Palestinian games, America's Army does in fact achieve a sort of sinister realism, for it can't help but foreground its own social ideology. It is not a subjugated ideology, but it is indeed an expression of political realities as they exist today in global military power struggles. Statistics on public opinion illustrate that the average American teenager playing America's Army quite possibly does harbour a strong nationalistic perspective on world events (even though chances are he will most likely never fight in America's real army). The game articulates this perspective. Again, this is not true realism, but, like it or not, it is a real articulation of the political advantage felt by and desired by the majority of Americans. It takes a game like Special Force, with all of Hizbullah's terror in the background, to see the stark, gruesome reality of America's Army in the foreground. Now my "congruence requirement" becomes more clear. It boils down to the affect of the gamer, and whether the game is a dreamy, fantastical diversion from that affect, or whether it is a one-to-one extension of it. With Special Force and Under Ash and earlier, but in a more complicated fashion,with America's Army there emerges a true congruence between the real political reality of the gamer and the ability for the game to mimic and extend that political reality, thereby satisfying the unrequited desires contained within it. Games are an active medium that requires constant physical input by the gamer: action, doing, pressing buttons, controlling, and so on (Aarseth,1997). Because of this, a realist game must be realist in doing, in action. And because the primary phenomenological reality of games is that of action (rather than looking, as it is with cinema in what Jameson once described as "rapt, mindless fascination"), it follows in a structural sense that the gamer has a more intimate relationship with the apparatus itself, and therefore with the deployment of realism. The gamer is significantly more than a mere audience member, but significantly less than a diegetic character. It is the act of doing, of manipulating the controller,that imbricates the gamer with the game. So, it is because games are an active medium that realism in gaming requires a special congruence between the social reality depicted in the game and the social reality known and lived by the gamer. This is something never mandated in the history of realist film, and may happen only occasionally in gaming depending on the game and the social context of the gamer. If one is a Hollywood filmmaker, the challenge is simply to come up with a realistic representation of reality. Or if one is a realist filmmaker, the challenge is to capture the social realities of the middle and lower classes. But because of the "congruence requirement"in gaming, if one is a realist game designer, the challenge is not only to capture the social realities of the downtrodden classes but also to inject the game back into the correct social milieu of available gamers where it rings true. From this one may deduce that realism in gaming is about a relationship between the game and the gamer. Not a causal relationship, as the Columbine theory might suggest, but a relationship nonetheless. In cinema, realism was merely a concern of the filmmaker during the making of the film De Sica's Bicycle Thief is still a neorealist picture no matter what social class is in the audience. But for games to be realist, they cannot be excised from the material realities in which they are played. To put it bluntly, a typical American youth playing Special Force is most likely not experiencing realism, where as realism is indeed possible for a young Palestinian gamer playing Special Force in the occupied territories. This fidelity of context is key for realism in gaming. Games signal a third phase for realism. The first two phases were realism in narrative (literature) and realism in images (painting, photography, film). Now there is also realism in action. Whereas the visual arts compel viewers to engage in the act of looking, games compel players to perform acts. Any game that depicts the real world must grapple with this question of action. In this way, realism in gaming is a process of revisiting the material substrate of the medium and establishing correspondences with specific activities existent in the social reality of the gamer. See Patrick Crogan (2003) for more on the intersection of gaming and the military information society. Julian Stallabrass's early essay "Just Gaming" (1993) is also methodologically instructive for how to think about games as allegories. See Johan Huizinga, Homo Ludens: A Study of the Play-Element in Culture (1950), p. 15. Huizinga's early exploration of the concept of play has been supplemented by theoretical work from, among others, Derrida (1978) and Geertz (1973). See also Shuen-shing Lee's (2003) "I Lose, Therefore I Think" A Search for Contemplation amid Wars of Push-Button Glare. Game Studies, 3. For more on Toywar see Adam Wishart and Regula Bochsler's book Leaving Reality Behind: etoy vs eToys.com & other battles to control cyberspace(New York: Ecco, 2003). The global nature of the Toywar is interesting to compare to Buckminster Fuller's "World Game," a very early example of a global asset management simulation game (1999). I first learned of Special Force through a March 2003 email post to Rhizome Raw from Jennifer and Kevin McCoy. Aarseth, Espen J. (1997) Cybertext: Perspectives on Ergodic Literature. Baltimore, Md., Johns Hopkins University Press. Atari. (1980a) BattleZone. [Arcade], USA: Atari. Atari. (1980b) Missile Command. [Arcade], USA: Atari. Bazin, André. (1971) What is Cinema? Volume II. Berkeley, University of California Press. C-level. (2003) Endgames: Waco Resurrection. [PC], Los Angeles, CA: C-level. Crogan, Patrick. (2003) The Experience of Information in Computer Games. Melbourne DAC, the 5th International Digital Arts and Culture Conference. Melbourne, School of Applied Communication, RMIT, Melbourne, Australia. <http://hypertext.rmit.edu.au/dac/papers/Crogan.pdf. Dar Al-Fikr. (2001) Under Ash. [PC], Syria: Dar Al-Fikr. Deleuze, Gilles. (1986) Cinema 1: Movement-Image. Minneapolis, University of Minnesota Press. Deleuze, Gilles. (1989) Cinema 2: The Time-Image. Minneapolis, University of Minnesota Press. Derrida, Jacques. (1978) Structure, Sign and Play in the Discourse of the Human Sciences. In: Derrida, Jacques (Ed.) Writing and Difference. Chicago, University of Chicago Press. Digital Extremes/Epic Games. (2003) Unreal Tournament 2003. [PC], New York, NY: Atari. Etoy. (1999) Toywar. [PC],Switzerland: Etoy. Frasca, Gonzalo. (2004) Videogames of the Oppressed: Critical Thinking, Education, Tolerance, and Other Trivial Issues. In: Harrigan, Pat & Wardrip-Fruin, Noah (Eds.) First Person: New Media as Story, Performance, and Game. Cambridge, The MIT Press. Fuller, R. Buckminster. (1999) World Game. Your Private Sky: The Art of Design Science. Baden, Switzerland: Lars Muller Publishers. Gearbox Studios. (1999) Half-Life: Opposing Force. [PC], Bellevue, WA: Sierra. Geertz, Clifford. (1973) Deep Play: Notes on the Balinese Cockfight. In: Geertz, Clifford (Ed.) The Interpretation of Cultures. New York, Basic Books. Hizbullah Central Internet Bureau. (2003) Special Force. [PC], Lebanon: Sunlight. Huizinga, Johan. (1950) Homo Ludens: A Study of the Play-Element in Culture. Boston, Beacon. Jameson, Fredric. (1992) Signatures of the Visible. New York, Routledge. Kinematic Collective. (2003) 911 Survivor. [PC], Los Angeles, CA: Kinematic Collective. Kuma Reality Games. (2004) Kuma\War. [PC], New York: Kuma Reality Games. Lee, Shuenshing. (2003) "I Lose, Therefore I Think" A Search for Contemplation amid Wars of Push-Button Glare. Game Studies, 3. Maxis Studios. (2003) TheSims: Hot Date. [PC], Redwood City, CA: Electronic Arts. Neversoft Entertainment. (2002) TonyHawk's Pro Skater 4. [PS2], Santa Monica, CA: Activision. Reichlin, Bruno. (2001) Figures of Neorealism in Italian Architecture (Part 1). Grey Room 05, Fall 2001, 80. Ritual Entertainment. (2003) Delta Force: Black Hawk Down. [PC], Calabasas, CA: NovaLogic. Rockstar. (2001) Grand Theft Auto III. [PC], New York, NY: Take Two Interactive. Shelley, Bruce. (2001) Guidelines for Developing Successful Games. [Online journal], 15 August, viewed 24 August 2004, <http://www.gamasutra.com/features/20010815/shelley_01.htm. Squaresoft. (2001) Final Fantasy X. [PS2], Costa Mesa, CA: Square EA. Stallabrass, Julian. (1993) Just Gaming: Allegory and Economy in Computer Games. New Left Review 198, March/April, 83-106. Tiburon. (2004) Madden NFL 2004. [PlayStation 2], Redwood City,CA: Electronic Arts Inc.
United States Army. (2002) America's Army. [PC], USA: United States Army. Valve. (1998) Half-Life. [PC], Bellevue, WA: Sierra. Vis Entertainment. (2003) State of Emergency. [PS2], New York: Rockstar Games. Williams. (1990) NARC. [Arcade], UK: Ocean Software. Zipper Interactive. (2002) SOCOM Navy Seals. [PS2], Foster City, CA. Copyright for articles published in this journal is retained by the journal, except for the right to republish in printed paper publications, which belongs to the authors, but with first publication rights granted to the journal. By virtue of their appearance in this open access journal, articles are free to use, with proper attribution, in educational and other non-commercial settings.